Let me start of this review by saying that it’s very sad that we at thecalmingseas.com haven’t been able to post more reviews since we started this part of our page in November (two and a half months ago). The problem is that we are in a position to dedicate as much time to this page as weâ€™d like to. This is an idealistic project for us and we work with it when we can, which means that the reviews updates will be quite sporadic and it will run with an unstable rate. Now for the review! This time our attention is turned towards not one but two albums. Two of our favourite albums from last year, two albums which both originate from the musical and creative sphere of Animal Collective. 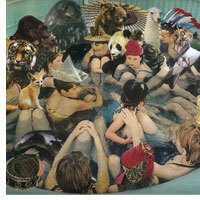 When I (the writer) first got in contact with Animal Collective I was actually somewhat negative towards the group. To be more specific, I felt a bit suspicious of their works and methods. Animal Collective was described (in music media) as a pop group who integrated arty and at sometimes chaotic psychedelic music with a folksy feeling and solid, original melodies. To me this sounds like the best kind of music possible. Coincidently it also sounds a lot like the music made by the bands which members at some point made up our beloved cosmonautic cowboys Beachwood Sparks. So why was I suspicious? Shouldnâ€™t I be thrilled to get in touch with new music that combines these things which I love with quite a passion? My problem was not such with what Animal Collective had created in itself but more so with the recognition they were getting. When a ‘new band’ (Animal Collective have been active since 2000) gets recognized for being musical pioneers in the style of music which I made an attempt to describe above I, as a Beachwood Spark fan, can become slightly bitter since I think that Beachwood Sparks don’t get the acknowledgment that they deserve for reviving the tradition of Cosmic American Music in the late 90s and early 00s. At first I approached this as if it were to be right to blame Animal Collective for the fact that Beachwood Sparks didnâ€™t get enough attention as great musical minds and use that blame as an excuse to ignore their music. I am very thankful though that I was enlightened to the fact that this approach is purely idiotic and that Animal Collective (and in its extension also Panda Bear) are awesome and should be checked by everyone who likes Beachwood Sparks! A couple of months before the release of Strawberry Jam, Panda Bear (Animal Collective member) released his second album Person Pitch, an album as good as if not even better than Strawberry Jam. 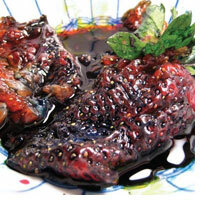 That album has a much mellower feel than Strawberry Jam. Some of the songs are very long (11-12 minutes) and almost feel like acoustic techno tracks which take inspiration from hippie spirituality rather than gospel and disco (which techno and house music is closely related to). Panda Bear is used to being one of many creative forces in his role as an Animal Collective member and when you listen to him as a solo artist you are exposed to his own musical vision, outside of his group. It is a vision which is very impressive to witness. On this album you find some of the weirdest and most beautiful music ever created. The music from the Animal Collective sphere originates from an east coast tradition. Animal Collective use a chaos-order, melody-noise dualism to give their work dramatic significance, a method used by many great bands from New York such as The Velvet Underground, Pere Ubu, Talking Heads etc. But if you were to add these albums together and try to comprehend them as a whole and then try to compare that whole to a whole made up by the body of work of the Beachwood Sparks music scene (BWS, The Tyde, All Night Radio, Mystic Chords of Memory etc. etc.) you could say that the Animal Collective whole is sort of a East Coast variant of the Beachwood Sparks scene. In the same way of course the Beachwood Sparks one is a west coast reflection of what Animal Collective are creating in New York. There is no original creation and no copy, this perspective is very outdated and uninteresting. The only thing interesting is that if you are a Beachwood Sparks fan you should check out this music and if you dig Animal Collective you should dig further into the world of psychedelic west coast music.